Norwegian expert says remains of highly toxic fuel will quickly be diluted in seawater. Two minutes and a few seconds after liftoff from Plesetsk cosmodrone in Arkhangelsk region, stage one of the booster separated and crashed into the Barents Sea. Launch of the military satellite happened last Saturday at 17.00 Moscow time (See video in the end of this article). Spokesman with the Norwegian Armed Forces Captain Brynjar Stordal confirms impact zones for the rocket debris. Norwegian Joint Headquarters has drawn a map to the Barents Observer showing two areas in the Barents Sea where debris from the rocket crashed into the sea. A third impact spot was in the waters between Greenland and Canada’s Ellesmere Island. Stage 1 had impact zone some 150 kilometres north of the Varanger Peninsula, while the payload fairing protection for the satellite fell further to the northwest in Norwegian sector of the Barents Sea. “The rocket debris are designed to sink when hitting the water. Launching of the missile from Plesetsk was announced upfront in accordance with international procedures, Capt Stordal tells. Soon after the launch, Russia’s Ministry of Defence announced the success that the satellite was inserted into its planned orbit. Previous launch from Plesetsk of a similar military satellite of the Geo-IK-2 type failed in 2011. Unsuccessful in reaching its orbit, the satellite was declared lost a few months later, according to the web-site Russian Strategic Nuclear Forces. Also NORAD today lists the new satellite and tracks it at a hight of 962 kilometres above earth surface. The Rokot carrier rocket is a derivative of the SS-19 intercontinental ballistic missile designed to carry nukes across the northern hemisphere. Inside the main booster, a mix of fuel chemicals is stuffed. Main component is dimethylhydrazine, a highly toxic carcinogen pollutant. Around Plesetsk and at Russia’s second cosmodrome, Baikonur in Kazakhstan, hydrazine and other chemicals in rocket fuel have devastated the environment. Parts of the rocket fuel tend to remain inside the booster when it shuts down as soon as the altitude is reached for the second stage of the rocket to start. How much was leftover on Saturday is unknown. What happens to marine ecosystems? The rather shallow Barents Sea is of high importance for fishing and considered to be one of the healthiest marine ecosystems worldwide. Are there any reasons to worry? Not too much according to Research Manager Øyvind Voie, with the Norwegian Defence Establishment (FFI). He explains how the fuel components in that particular rocket are diluted in seawater. “Both dinitrogen tetroxide and dimethyl hydrazine in Rokot’s first stage are compounds that mix well with water,” Dr. Voie says. And the decomposition goes faster in seawater than in fresh water. “Probably it will not be possible to find measurable concentrations of dimethyl hydrazine in the seawater where the rocket booster crashed,” Øyvind Voie explains. Although most rocket launches from Plesetsk cosmodrome takes a northbound route over Arkhangelsk Oblast and the Republic of Komi, a few are directed northwest over the Kola Peninsula and Barents Sea before reaching orbit. In February, Acting Head of the Komi Republic Sergey Gaplikov called on Russia’s federal space agency Roskosmos to remove space related materials that for decades have been falling down from the skies. Capt Brynjar Stordal with the Norwegian Armed Forces says since 1999 some 10 Rokot launchings from Plesetsk have had the same direction as the one last Saturday. Norway’s new intelligence gathering vessel “Marjata” was Saturday spotted outside the coast of Varanger. 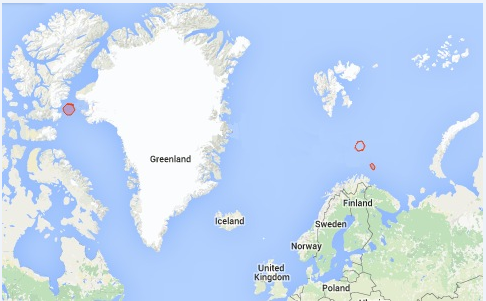 The vessel keeps track of Russian military activities in the north. In Vardø, on the easternmost spot on the Varanger Peninsula near the maritime border to Russia, Norway’s intelligence radar Globus II is used for space surveillance. The video below was posted on Twitter by @roscosmos and shows the liftoff from Plesetsk last Saturday.